Here at 23MD, we offer our first-rate Dermalux® LED Phototherapy, which is a multi-award-winning rejuvenation treatment that aims to produce naturally-radiant skin that is clear from all impurities. Dermalux® LED Phototherapy utilises Light Emitting Diode (LED) technology by applying doses of light wavelengths to the skin in order to stimulate it and resolve any existing skin conditions or impairments, such as ageing, acne, sun damage, pigmentation and more. Although it may appear counterproductive to expose the skin to infrared light, due to the negative effect it can have on the skin, controlled levels of near, blue and red infrared light are actually extremely beneficial for skin repair. This is due to the high levels of vitamin D and serotonin, which are vital elements for speeding up the tissue healing process. Dermalux® technology is designed to enhance the skin therapeutically through stimulation via infrared wavelengths, which work to repair the skin and create more collagen and elastin in order to reduce skin problems. Dermalux® is a non-invasive treatment that is completely pain-free and safe – even those with the most sensitive skin can benefit from this premier technology. However, this not an exhaustive list, therefore, if you have any other issues that you believe Dermalux® can help with, do not hesitate to contact us and speak to one of our expert physicians for advice on treatment. WHAT ARE THE RESULTS WITH DERMALUX®? Once you have received your Dermalux® treatment you may notice some changes immediately, such as a brighter and hydrated complexion, whilst also feeling energised and de-stressed. Many patients notice these changes; however, results will become more visible after you have received several treatments and should continue to appear up to six weeks after. In order to hasten your results, you should combine your regular skin routine alongside the Dermalux® treatment, which is guaranteed to show results almost straight away. All results will be dependent on the type of treatment you receive, which will be advised by your 23MD practitioner. If you are looking for complete skin rejuvenation the LED red light treatment is perfect for improving the look and feel of your skin, as it increases collagen and elastin production which results in firmer-looking smoother skin. The LED red light also reduces the appearance of wrinkles, evens skin tone, shrinks pores, and hydrates your skin for an overall feeling of radiance. Near-infrared light works in conjunction with the red light in order to achieve optimum skin results for ultimate patient satisfaction. 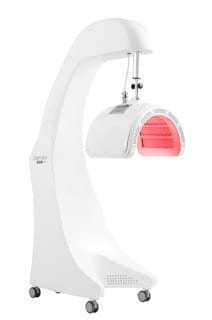 LED infrared and red light work together to create a cutting-edge anti-ageing treatment that enables efficient skin tightening, pigmentation and scar reduction. All of these elements combined will ensure that your skin is more youthful and hydrated, giving you the self-esteem boost you need. This treatment also works to significantly reduce pain and inflammation to ensure that you can continue with your everyday tasks in a comfortable and confident manner. The LED blue light is perfect for anyone who suffers from acne and regular breakouts, as it significantly reduces the production of bacteria. This treatment is a non-irritative procedure which treats acne and spots, whilst also preventing potential breakouts by stabilising oil production. Here at 23MD, we offer a combined service which involves incorporating all the necessary infrared lights in order to target a number of problem areas. Our expert physicians will ensure that you receive the combined treatment that is suited to your needs and fulfils your requested desires. Book a Dermalux® consultation today, or for further information on our Dermalux® LED Phototherapy service you can call us on 020 7070 80302.